Ai Weiwei will probably be regarded as the most important artist of the past decade. He is certainly its most newsworthy and arguably its most inspiring. Over the repressions of Chinese authorities, he has used a wide range of resources to broadcast a message of freedom. Through his art, he has spoken with a voice that also includes those who have been silenced. A dissident under a capricious regime, he has endured trials that have captivated world attention while galvanizing an underground culture at home. The arrival this week of Mr. Ai's first North American retrospective, "Ai Weiwei: According to What? "—which begins at the Hirshhorn Museum in Washington and travels to three other cities, concluding at the Brooklyn Museum in 2014—is itself newsworthy. That this exhibition largely fails to inspire not only speaks to Mr. Ai's own limitations but also to the challenges and missteps in exhibiting this increasingly multifaceted artist. It bears remembering that following his youth in a Chinese labor camp and his punk bohemian immersion in 1980s New York, for several years Mr. Ai, now 55, was a member of Beijing's cultural elite. A sly thinker and adept designer, he emerged in the late 1990s along with the booming market for contemporary Chinese art to become a sanctioned and profitable ambassador of the modernized socialist state. In 2008, he even served as the artistic consultant on National Stadium, the "Bird's Nest" centerpiece of the Beijing summer Olympics. It was the Sichuan earthquake in May of that year that turned Mr. Ai from cultural purveyor to iconoclast. He rightly believed that the tragedy of this event, a thousand miles from Beijing in the heart of rural China, was magnified by the state's refusal to investigate its particularly tragic circumstances: the death of more than 5,000 children due to shoddy school construction. In the years that followed, Mr. Ai put this belief into action. He visited the devastation, documenting the sites in photos and videos, and organized what he called a "citizens' investigation" to identify and memorialize each child killed in this disaster. As he pursued this project, Mr. Ai increasingly faced off with the Communist state. He came under surveillance and sustained a beating at the hands of local police, a life-threatening brain injury, the destruction of his studio in Shanghai, 81 days of imprisonment and psychological torture, a state-driven campaign of intimidation, multimillion-dollar charges and fines, and the stripping of his freedom to leave the country—including his plans to attend this North American retrospective. The Hirshhorn show is an update of the one at Tokyo's Mori Art Museum in 2009, which was organized largely before Mr. Ai's dissident chapter. While the current exhibition brings in some important new pieces, it still feels weighted toward the state-sanctioned years. Even the recent selection largely follows the earlier formula. Much of this work falls under what I call the Salon style of contemporary Chinese art: Oriental idioms, passed through Pop-art sensibilities, processed into large works with a factorylike finish. Mr. Ai can be particularly taken with Western art's historical references. Several examples here are minimalist-inspired sculptures with flourishes of Chinoiserie. "Cube in Ebony" (2009), carved with a traditional rusticated surface, recalls Tony Smith's "Die." "Moon Chest" (2008), created through traditional cabinet-making techniques, riffs off Donald Judd's "specific objects." "Cube Light" (2008), which is a recent acquisition by the Hirshhorn and also the most oversized, underwhelming piece in the show, is minimalism transformed into a kitschy chandelier. Too much real estate gets taken up by these large works. The Mori's Mami Kataoka, who also curated this show, calls the art a "warm" minimalism for existing "between formalist and contextual methodologies"—in other words, Western work with an Eastern twist. It is true that Mr. Ai includes personal, social and political references in his sculptures. At times they can seem like the coded messages of a prisoner tapping on his cell wall. "Surveillance Camera" (2010), a marble sculpture that turns an object of oppression into a work of art, is ominous and poignant. But often the sculpture, outsourced to inexpensive Chinese artisans, is a lot of effort for not much return. Sculptures that require lengthy explanations—that one was inspired by a small wooden box left by the artist's dissident poet father, Ai Qing, or that one was inspired by the shaking of the chandelier in Sergei Eisenstein's 1928 film "October"—are not so much "warm" as warmed over. 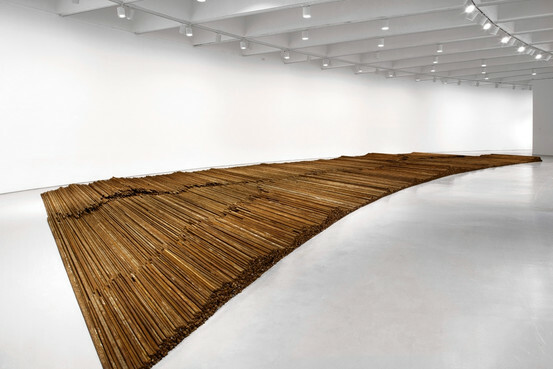 One exception is "Straight" (2008-2012), a new floor installation made up of 38 tons of rebar recovered from Sichuan after the earthquake that is a rough and powerful work regardless of what else we know about it. Mr. Ai has always been a conceptual artist. The challenge of a conventional museum exhibition is that his output has become more and more immaterial. It could be that Mr. Ai is now best reflected in other ways—for example in Alison Klayman's inspiring documentary "Ai Weiwei: Never Sorry." Blogging, Twitter and the Internet itself, to which Mr. Ai devotes eight hours a day, have become his genuine new media and his most consequential work. Unfortunately, this traditionally mounted show tells us little about that. Walls of photographs—with both wonderful snapshots from his New York years and thousands of digital images from his Internet feed—could offer extra context, but they are so poorly labeled and hung so high that they serve as little more than decoration. For a retrospective, there is also regrettably little about his involvement in the Beijing avant-garde of the late 1970s—he was part of the "Stars" group during a brief thaw known as the "Beijing Spring." Nor are there examples of his underground books published in the mid-1990s. A deep humanity runs through Mr. Ai's best work. "I've experienced dramatic changes in my living and working conditions over the past few years," he says in an interview with Hirshhorn curator Kerry Brougher reproduced in the exhibition catalog. But he resists being taken in by his own politics. "Maybe I'm just an undercover artist in the disguise of a dissident," he says. Believing in "freedom of speech, free expression, the value of life, and individual rights," he tempers his politics with empathy. That's why his work on the "citizens' investigation" is so affecting and stands apart from the more ornamental aspects of this show. Alongside a wall-size spreadsheet listing all the child victims of the Sichuan quake, including their birthdays and schools, he presents a recording that reads off their names. In this stripped-down piece, we sense the full extent of the loss, a tragedy that is magnified for the victims' parents by China's one-child policy: "These people have cried a lifetime's worth of tears," says Mr. Ai. "In their hearts, they know that the precious lives they gave everything to protect are no longer." Beyond politics, the work strikes at the heart of death and remembrance. It also shows us how present this artist can be even in his absence—and just what is missing in so much else of this exhibition. A version of this article appeared October 9, 2012, on page D5 in the U.S. edition of The Wall Street Journal, with the headline: The Artist Is Absent.